The Snow Peak Titanium Plate allows ultralight trekkers to dine in style. Weighing in at a scant 2 ounces, you won't even know it's in your pack until it's time for dinner. 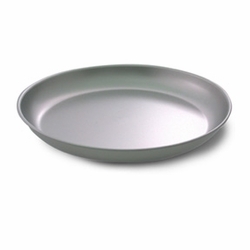 Why bother with flimsy plastic plates when you can have a solid titanium plate that weighs next to nothing?